Funny Cide Bobblehead Following his classic campaign, Churchill Downs honored the 2003 Kentucky Derby winner, Funny Cide, with a promotional bobblehead give-away. This promotion continued the immensely successful give-away program featuring the mini-bobbles of Secretariat, Seattle Slew, and Affirmed. 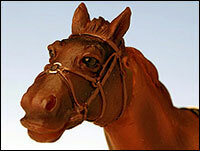 The amazing response to the earlier equine bobble give-aways, as well as the huge number of requests to produce a continuing series of the unique figurines, inspired Churchill Downs to carry on this collectible tradition for its patrons and fans. For those of you who didn't make the event, or for those of you who want a quantity for collecting, Secretariat.com is proud to offer you the opportunity to purchase the one and only official Funny Cide Bobblehead. This whimsical version, celebrating the popularity and excellence of Thoroughbred racing's finest, continues to demonstrate our commitment to quality and detail that can be found within our unique bobble line. Here we feature the pride of the Sackatoga Stables in a classic Winner's Circle pose, wearing the black saddlecloth with the familiar yellow number 6 from his exceptional victory in the 129th Run for the Roses. 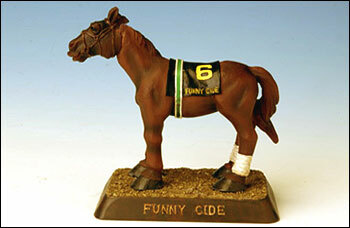 The Funny Cide bobble shows the flashy chestnut gelding in vivid detail from his white ankle wraps to his distinctive cross-over bit. Measuring nearly 6 inches long by 5.5 inches tall and sure to create a smile. Once again, only through Secretariat.com are you guaranteed the lowest serial numbers as our inventory consists of just the first 1000 pieces produced in this limited edition run. With widespread collectibility, our earlier releases - the first and second Secretariat Limited Edition bobbleheads, as well as the Triple Crown mini-bobble sets - have all sold out enjoying investment potential status on the secondary market. For the serious memorabilia collector or the everyday racing fan, order now and don't get left at the gate. 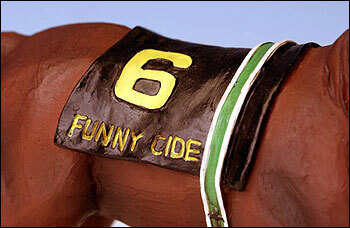 For complete Funny Cide official product line, please click here!